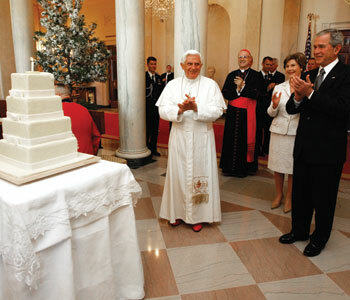 President Bush and first lady Laura Bush lead the celebration of Pope Benedict XVI’s 81st birthday as he’s presented a cake by White House pastry chef Bill Yosses on April 16, 2008, at the White House in Washington. The retired pope, who rarely makes public appearances, may participate in the Easter Sunday Mass in St. Peter’s Basilica, my sources tell me. No public celebrations are planned, but you can be sure that his inner circle of friends will shower him with well-wishes. I was among the hundreds of media surrounding Benedict’s visit to Washington and New York nine years ago. 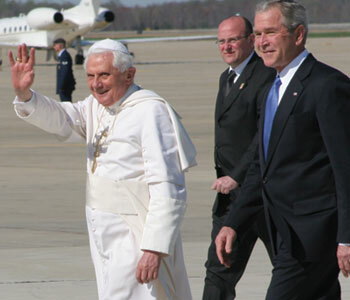 I was at Andrews Air Force Base when the Holy Father set foot on U.S. soil for the first time as pope. Many Legatus members were on the White House lawn for the remarkable celebration of his 81st birthday. Who can forget the massive cake that President Bush had prepared for him? Benedict’s birthday this year will mark yet another milestone. He will become only the second pope to live into his nineties. Pope Leo XIII, elected in 1878, lived to the ripe old age of 93 years, 140 days. He reigned on the Chair of Peter for 25 years, 150 days. Although Benedict has been mostly silent since his resignation four years ago, his legacy and impact on the Church are still felt — and will no doubt be felt for many decades to follow. Markedly different in style and personality from his successor, Benedict’s depth and intellect were evident in his teaching. CruxNow.com reports that due to age and limited vision, Benedict no longer writes, but with the consent of his successor, last year three lengthy interviews were published. One was a 2015 conversation with Jesuit theologian Jacques Servais, on the doctrine of justification and faith. Then there was the interview with his Italian biographer, Elio Gueriero, published in the book Servant of God and Humanity: The Biography of Benedict XVI, prefaced by Pope Francis. Last but not least, there was the book-length interview, Last Testament: In His Own Words, with German journalist Peter Seewald, with whom the pontiff had already done two similar projects. The book represented the first time in history that a pope described his own pontificate after it ended. PATRICK NOVECOSKY is the editor of this blog. This article appeared in the April issue of Legatus magazine.